If you’re interested in how to start a successful marketplace, Matt Mickiewicz is a man to study. Matt has previously started two successful marketplaces: Flippa and 99designs. 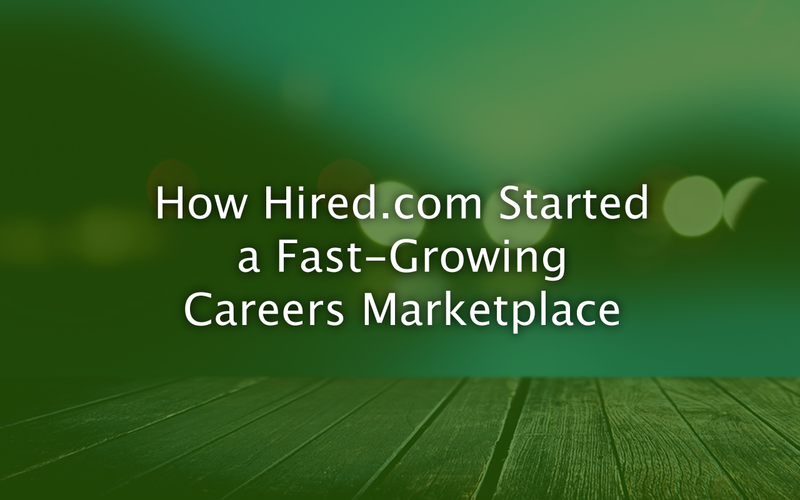 His latest business, Hired.com, is a job marketplace which — after just three years — is doing tens of millions of dollars in annual sales and has raised over $70 million in funding. Matt was recently interviewed by Andrew Warner of Mixergy (transcript here) about how Hired.com was started. As usual, Andrew dug down to some great details. If you’re building a marketplace, there’s plenty to learn from. Over dinner after a conference on April 27th 2012, Matt got talking with a couple of other successful entrepreneurs about a problem that they and many of their friends were frustrated by: not being able to find good people to hire. They knocked around some ideas for a marketplace to help match the best candidates with the best companies. One of the guys (a CTO) offered to build it, saying it would be worth it if it helped him find even one software engineer for the company he had at the time. Matt created some wireframes, landing pages, ad copy, emails, etc. and the CTO guy built it. The first version was at DeveloperAuction.com. Geography: They concentrated on a specific geographic area (the San Francisco Bay Area). Supply-side: They only accepted candidates from five or six Silicon Valley companies (Google, Facebook, Twitter, and others) with a reputation for hiring good engineers. Demand-side: They only allowed VC-backed Silicon Valley companies to make job offers. This focus increased the chances of any pair of candidate and potential employer on the platform being interested in one another. So with relatively few candidates and employers, they could still start getting ‘matches’. This was a novel pitch to the engineers (who were used to being bombarded with requests from recruiters) and Matt feels it was an important reason why it caught their attention and encouraged the engineers to sign up. Through these emails, the Hired founders got 88 engineers to create profiles on the platform. They expected a good response. After all, these companies were keen to hire software engineers. But the approach didn’t work. Matt thinks the problem was that they didn’t have any credibility at that stage, and so came off as being like the many other recruitment services that were pitching these companies at the time. The Hired team then tried a new approach: they reached out to the investors they knew and asked them to tell their portfolio companies about the new service. Some of the investors contacted their portfolio companies about the new platform and some of those portfolio companies started using the platform. They provided upfront transparency to candidates about the compensation they could receive if hired. This differentiation helped them get attention when contacting people directly and also helped them get a TechCrunch article which generated a lot of interest in the service early on (resulting in around 5,000 developers and hundreds of employers signing up to the service). it meant that strong candidates could end up with multiple offers on the table at the same time, allowing them to compare those offers better. At a stage when they had $2.7 million in seed funding, the team spent $10k to $20k on a branding/naming consultancy and around $125,000 on the domain name Hired.com. Despite their initial challenge with getting employers on board, the team viewed candidates as being the hardest side of the marketplace to get in place. With this in mind, for the first 3 years, Hired focused almost all their resources on attracting and improving the experience for candidates (knowing that with the right candidates, prospective employers would follow). This included building a team of ‘talent advocates’ to help candidates through the recruitment process. These are people with high EQ who are incentivised around Net Promoter Score, not recruitment commission. Hired.com are only now looking at ways to directly boost the employer side of their marketplace as well. They talk to lots of customers and run user research feedback sessions. They continue to test new approaches, some which work, some which don’t. They are very data-driven with a data team and business intelligence infrastructure, with data available to the entire company. This has led to them dramatically reducing the end-to-end time it takes for someone to be recruited. Identified a very severe and common pain point. Focussed tightly to get initial liquidity. Raised lots of capital to double down on the opportunity (but only after proving the concept, and the founders’ track records presumably helped). Focussed resources on building the most in-demand side of the marketplace (great candidates), which attracted the other side (hiring companies) for free. If you’re interested in this kind of thing, do have a read of the transcript of the interview here. Very nice thought behind Hired.com. Your phase 3 about it’s growth is very impressive it is very important to tell people about your uniqueness and invest in branding. Thanks to share with us. Matt's a product and technology consultant based in London, helping businesses build good digital products and services in smart ways. He is passionate about building the right things as well as building things right. Prior to helping other companies with product and technology, Matt was co-founder and CTO at several startups and a software engineer at Cisco Systems. Matt has an MBA from INSEAD and a degree in Maths and Computation from Oxford University. If you're interested in working together, please contact Matt here.